Mom looked at all the lake pictures and all of you sure live in a beautiful spot. You really have a great house with all those windows that you are able to look out of. You definitely live in a place to gather many beautiful pictures. Mom likes sparkly water too, and beautiful sunrises and sunsets. That's why she has so many pictures of the river by us. I see you had seven humming birds around your feeder. Mom got a picture of five around hers where we used to live. Live on in your beautiful home. 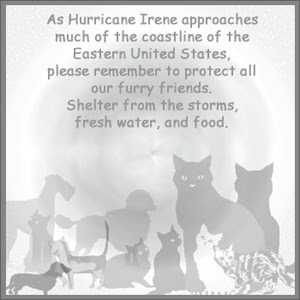 We made it through Irene. We hope all others did too.